Cancer, that malignant force that maims and kills as it rampages through bodies and lives, may have met its match in the person of James Wells ’79 PhD. Wells speaks quietly but with urgency. You have to lean in to not miss anything. Wells is explaining that cancer’s derangement of our lives actually begins at the surface of individual cells. The complex chemical ecology of the cell membrane surface deserves its own term of art, so Wells dubs it the “surfaceome.” “The cell membrane is the eyes, ears, nose, and mouth of a cell,” he says. If Wells and his colleagues could get antibodies—engineered proteins—to bind to the surface of cancer cells, they’d no longer be hidden from the immune system. Like the fog shrouding the enemy suddenly lifting, the immune system’s cavalry can charge in and clean up. Unfortunately for cancer, Wells is a protein engineer and pharmaceutical chemist nonpareil. 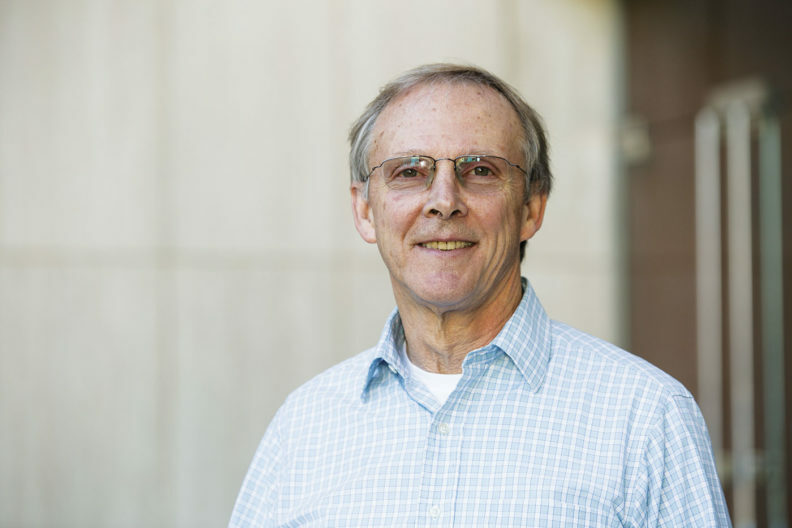 Fortunately for human health, then, Wells came to Washington State University back in the 1970s to study with the eminent and now emeritus professor Ralph Yount. The sponge thing must have worked, as Wells left WSU with a doctorate—and nine first-author papers, a level of production that a seasoned professional would be happy with. He’s published over 100 more since then. Coming to study with Yount was, Wells says, one of the great positive decisions of his life. Another was marrying his girlfriend, Carol, while living in Pullman. “We got married on the lawn of the house we were renting at 1215 Latta Street,” he says. Latta Street is long gone, but the house was near the present-day intersection of Valley Road and Stadium Way. “There were about 100 people there. We ate steaks and played volleyball. One of Wells’ first jobs was with Genentech. He started work with a question that, at the time, everyone thought was already answered: Can we make enzymes better? The answer, so obvious to everyone but Wells, was a resounding “No!” You can’t improve on nature, which, after all, has had millions upon millions of years to get the function of enzymes exactly right. Wells and his team got going on a protein called subtilisin (most proteins function as enzymes). After Wells made a few alterations to it, subtilisin became a commercial hit: It’s the enzyme used in Tide detergent and many other products. And along the way, Wells made some major discoveries about the interactions between the cell surface and proteins that would fuel his future work. Now at the University of California, San Francisco, Wells and his team focus on inventing tools that enable rapid drug development. Wells brings interdisciplinary teams together, including computer scientists and experts in automation, in order to accelerate the discovery process. Wells returned to the Palouse this year as the recipient of the 2017 Regents’ Distinguished Alumnus Award, the University’s highest honor, in recognition of his contributions to protein engineering and pharmaceutical chemistry.